Fight fans in Compostela were treated to an exciting night of boxing last Saturday with a fight card that featured a triple main event. Marvelous Marvin Sonsona, the reigning WBO Asia-Pacific Youth Flyweight Champion, scored a first round TKO win over Jason Geda ( 9W-7L-3D). Sonsona launched a vicious two fisted attack from the opening bell prompting his hapless opponent’s corner to throw in the towel. Sonsona remains undefeated in 10 fights with 9 knockouts. Former IBF world minimumweight champion Florante Condes won by technical decision over Ronnelle Ferreras. Despite showing superior strength Condes attacked in spurts allowing his opponent to pin him on the ropes. Condes’ reputation as a knockout artist had the crowd cheering every time he initiated an attack. But an accidental clash of heads in the fifth round lead to a cut on the corner of Condes’ right eyelid. The ring physician recommended a halt to the bout and it went to the scorecards. One judge had it 48-47 for Ferreras and two judges had it 48-47 for Condes awarding him the victory. Condes (23W- 4L – 1 D, 20 KO’s) won the title by a twelve round unanimous decision over Muhammad Rachman of Indonesia in Jakarta last July 2007 and lost in his long-delayed first title defense against Raul “Rayito” Garcia in the Mexican’s hometown by a split decision after dropping Garcia late in the fight. WBO Oriental jr. lightweight titlist Anthony “Rocky” Marcial (11W -0L, 10 KO’s) won by second round TKO over Meivin Ayudtud. The taller Marcial peppered his opponent with jabs and one-two combos in the first round. In the second round a wicked right uppercut dropped his opponent prompting the stoppage win. In the most dramatic fight of the evening, challenger Rodel Quilaton wrested the PBF jr. flyweight crown from Ronald Castrodes. The protagonists boxed tentatively in the first five rounds. Castrodes scored a flash knockdown in the sixth round when Quilaton was caught with a swinging left. But the challenger charged like a raging bull in the seventh and threw a hail of punches that sent the champion’s mouthpiece flying out of the ring. Quilaton pressed the attack and scored a knockdown. Castrodes stood up but was visibly dazed and was saved by the bell. In the 8th round a one-two combination sent Castrodes once again on his back. He picked himself up and once again the bell mercifully saved him. 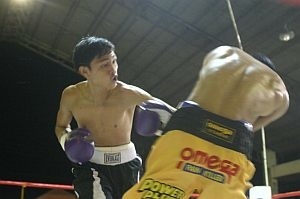 Castrodes regained his bearings in the 9th but Quilaton continued to land the stronger punches in the last two rounds. The three judges’ scorecards all read 95-92 for the new champion Quilaton who now improves to 12W – 8 L, 3KO’s. Castrodes suffered his first career loss and is now 6W-1L with 3KO’s. Top photo: Sonsona presses the attack against Geda en route to a first round TKO victory. Condes (R) looks for an opening against Ronelle Ferreras. 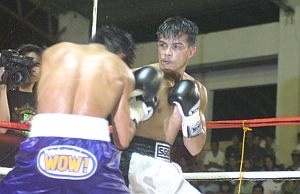 Anthony Marcial (L) throws a hook against Melvin Ayudtud. Photos by King Catriz / PhilBoxing.com. Jason Perater and Elf Gitgano engaged in a fan-friendly featherweight brawl. Perater landed the more telling blows forcing his opponent to retire on his stool at the end of the 6th round. This was Gitgano’s first loss. Reil Mandate launched a blistering attack that sent Edzel Tunacao down for the count and scored a third round KO win in their minimumweight contest. In a bruising encounter marked by furious exchanges, Lt. flyweights Andy Seneres and Jason Canoy battled to a split draw after six rounds. The scorecards read: 58-56 for Seeneres, 58-56 for Canoy and 57-57 all. Loloy dela Pena won over JR Mamulang by majority decision in a four round superflyweight bout. The scores: 39-37, 39-37 and 38-38. Gerson Mercado knocked down Ricky Nunez in the first round and continued to control the action enroute to a 4 round unanimous decision win in their minimumweight contest. All three scorecards read 39-36. In the first bout of the evening, Fabian Manzano won over Samuel Galinato by majority decision in a superbantamweight tussle. The scores; 37-35, 39-38, 38-38. The event held at the Compostela Gymnasium was also billed as the 2nd Mayor Ritchie R. Wagas “Sinukmagay sa Compostela” and promoted by GRW Productions and SGG Promotions and the Municipality of Compostela.